Half-empty liquor bottles, tumultuous relationships with dangerous women and a haggard-literary-proletariat persona. No, this is not my OK Cupid profile (I swear). It’s all about poet and writer Charles Bukowski. The hard-drinking womanizer and horse racing aficionado, who was aptly dubbed “The Laureate of the American Lowlife” by Time magazine would have been 91 years old tomorrow. If you love stories of hopeless, hedonistic alky-degens as much as we do—or just want to roister and revel with like-minded lost souls, fall by the Mission Theatre (1624 NW Glisan) tonight for readings, writings, and a screening of the semi-autobiographical (and Bukowski penned) film Barfly, starring Mickey Rourke (who else?) 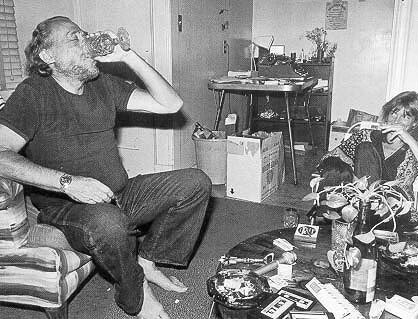 as Bukowski’s alter ego Henry Chinaski. 21 and over only, $5. Doors at 8:30, readings at 9pm and Barfly at 9:30pm.